Have you ever tried to get a kid with ADHD to use a regular textbook? My mom used to call it “like pulling teeth.” That is to say, ridiculously hard and painful for everyone. 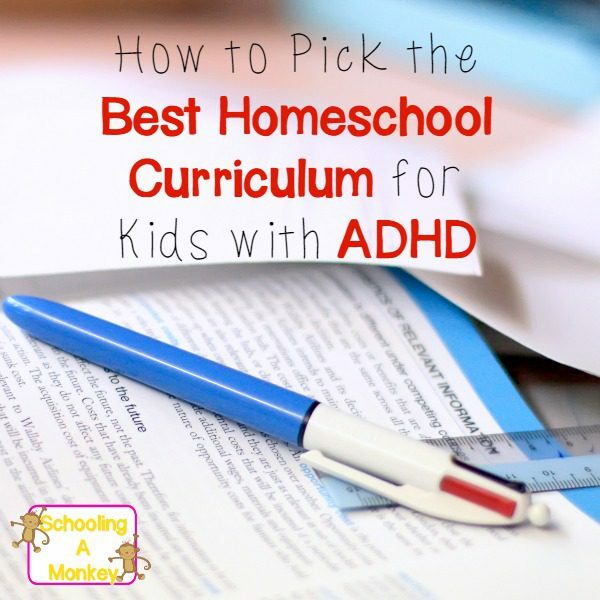 My goal today is to help you avoid some of that pain by teaching you how to pick the best homeschool curriculum for ADHD kids. I’ll be the first to tell you that not every child with ADHD is the same. Of course, children with ADHD do tend to have similar learning styles and distracability, but personalities are as varied as in any other people group. You might have the unusual ADHD child who loves learning from a textbook (my husband was one of those). So, please take my advice and customize it to your own situation. 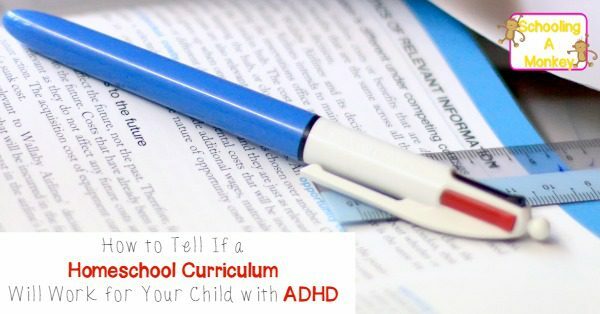 In general, however, if you follow these tips you will definitely be setting your ADHD homeschool up for success. Finding your child’s learning style is one of the keys to success in any homeschool. I dive into homeschool learning styles a little bit in this post, but most kids with ADHD seem to prefer hands-on learning. My kids love active learning and anything they can do while moving about. This test can help you Finding your child’s learning style. From there, you can know what to avoid when shopping for curriculum, like a literature-based curriculum for a kid who hates reading. When you are shopping for homeschool curriculum, it is pretty easy to see which curriculum are designed with parents in mind and which are designed with kids in mind. Monkey gets overwhelmed by curriculum that is just pages and pages of text or numbers without anything to break it up. The best curriculum format for her is one that is broken into small chunks, such as with important information in little boxes, pictures, and a lot of space between paragraphs. She also needs a lot of blank space on a page. Curriculum gets bonus points in our house if it includes hands-on activities, jokes, silly math problems, or anything to make learning the boring stuff just a bit more exciting. If you ask your ADHD kid what they are into, they will most likely tell you. What I like to do is add two things to study each year based on what Monkey is into at the time. Usually, this has helped us have more science activities in our homeschool, but we’ve also done some pretty fun math games, too! If you can find the basics set in a fun format, or in a format that includes characters that your ADHD child loves, that can really help, too. Monkey and Bo love dinosaurs, so they would be tickled to see dinosaur-themed writing assignments for example. Most children with ADHD are easily bored and distracted. Things that are fun are more likely to hold their interest. That is why I’ve spent a good portion of the last few years trying to make learning fun for Monkey and Bo. We have tried hundreds of fun learning activities in an effort to keep our school fun and engaging. 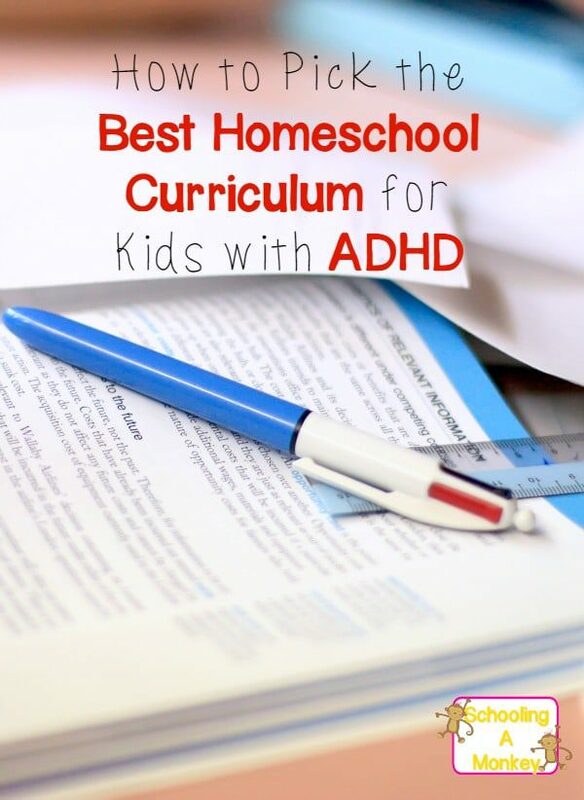 So far, it’s been working, and sometimes no curriculum is the best homeschool curriculum for ADHD! If you need activity ideas, we have a huge catalog of STEM activities for kids and educational screen-free activities. Sometimes when you think you have the perfect homeschool curriculum, it still bombs. This happened to us with Monkey’s fourth grade English. We loved her third grade English, so we purchased the same curriculum for fourth grade. But it was too repetitive, and Monkey ended up not learning anything from that book. So, we had to switch to learning language arts in other ways. More fun ways. Don’t be afraid to switch curriculum if something isn’t working in your homeschool. You can always sell your used curriculum at a used book fair.